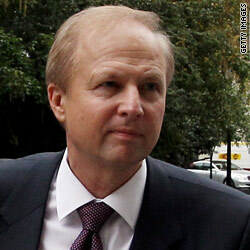 The Mississippi-born chemical engineer will be the first American chief executive officer of BP Worldwide. Tuesday, BP announced that Dudley will replace the firm's British executive Tony Hayward, following criticism of Hayward's initial response to the Gulf of Mexico oil disaster, and a resulting $17 billion loss directly tied to the event. Hayward has been reassigned to TNK-BP, a Russian oil and gas venture, where Dudley served for five years, departing in 2008. The change is scheduled for October 1. Currently the managing director for the oil giant's U.S. operations, Dudley took over the cleanup efforts on day 49. Ironically, Dudley was originally passed over as BP CEO in favor of Hayward in 2007, the Wall Street Journal reported. At the time, Dudley had run TNK-BP Russia for five years. In 2008, Russian shareholders drove him out, the paper said. In his new role, Dudley will be expected to continue working closely with White House and Gulf Coast officials on resolving the oil spill crisis. "My own personal priority is to listen to the people, the claims centers, the officials and to make sure that we can get the resources and get them there as fast as we can," Dudley said in an interview with CBS last month. CNNMoney: Who is Bob Dudley? The ESPN correspondent will testify on Capitol Hill on Tuesday, calling for federal legislation to toughen punishment for stalkers. Andrews was subjected to national humiliation and death threats after a man taped her through a hotel peephole in 2009. The tape was then leaked on the internet. The man, Michael David Barrett, was sentenced to 2 1⁄2 years for the crime earlier this year. Andrews has received national support. She was promoted at ESPN, and was a runner-up on ABC's "Dancing with the Stars." The Bell, California, city councilman has successfully led an effort to persuade his colleagues - including Mayor Oscar Hernandez - to reduce their controversial salaries, and in the case of Hernandez, apologize. According to the Los Angeles Times, Velez, who was appointed - not elected - to his position last summer, spent the weekend lobbying colleagues to adjust their salaries from $96,000 to his salary of $8,000. Upon apologizing, Hernandez said he will work the remainder of his term for free. Three other administrators, who collectively were being paid about $1.6 million, have resigned. An investigation is pending. The Fresno, California-based commercial painter, who paid $45 for a box of glass film negatives at a garage sale in 2000, has proven that he actually owns a massive archive of lost works by the iconic photographer Ansel Adams - and they are worth an estimated $200 million. Norsigian has spent the past 10 years trying to prove the negatives were significant. Various experts and a Beverly Hills appraiser have authenticated and valued the works, which go on display Tuesday night in Los Angeles. "It truly is a missing link of Ansel Adams and history and his career," said David Streets, the appraiser who will host the unveling Tuesday. The photographs apparently were taken between 1919 and the early 1930s, well before Adams became nationally recognized. According to Norsigian's website, he was perusing items at a garage sale in 2000 when he found a wooden box holding aging manila envelopes that contained glass negatives wrapped in newspaper. The paper dated back to the early 1940s. He haggled the owner from an original $70 price to $45. Norsigian then met repeatedly with curators and Adams historians, and even hired an entertainment lawyer and experts to confirm his theory. The Tennessee-based locksmith is running for the Robertson County Commission on a platform of frugality. Wolbert is campaigning on a message of save, not spend. So he has pledged to spend no more than $45 on his campaign. "Saving money, that's kind of where we're at in our life, and I think that the County Commission ought to be the same," Wolbert told Nashville's News Channel 5.
has been BP deliberately KILLED from its inside??? but they haven't used it, leaving this giant disaster to happen for TWO MORE MONTHS !!! so, "could" have "someone" inside BP deliberately done that to see the company's value to FALL very much and very quickly, to take over the company or sell it to another company for a few cents price??? will, the Press, investigate on this hypothesis??? You're an idiot. BP has some of the best engineers in the world employed and you honestly think that they were dumb enough to overlook this? Take the tinfoil hat off, loopy. "BP has some of the best engineers in the world"
I'm sorry the new meds have had time to work yet. Please forgive me. I disagree with choosing this person as intriguing.